Falling in love is never simple. Especially when you're dead. When Rosie Potter wakes up one morning with what she assumes is the world's worst hangover, the last thing she expects is to discover that she's actually dead. With a frustrating case of amnesia, suspicious circumstances surrounding her untimely demise, and stuck wearing her ugliest flannel PJs, Rosie must figure out not only what happened last night, but why on earth she's still here. Slowly the mystery unravels, but there are many other secrets buried in the quiet Irish village of Ballycarragh, and nobody is as innocent as they first appear. Aided by the unlikeliest of allies in her investigation, Rosie discovers that life after death isn't all it's cracked up to be, particularly when you might just be falling in love . . . In this hilarious, life-affirming and romantic journey through Rosie Potter's afterlife, she shares the ghostly tale of how she lived, she died, and she loved (in that order). I wouldn't usually read chick-lit, but there were a couple of reasons that made me read this book, despite the genre. Firstly, the book is written by a local ( you gotta support your own , HUP SLIGO), and secondly because this is no regular chick-lit. The best way to describe The Happy Ever Afterlife of Rosie Potter (RIP) , hereafter referred to as Rosie Potter , is a rom-com slapstick paranormal murder mystery, like a crossover between Father Ted and Bridget Jones’ Diary and that Reese Witherspoon film where she’s a ghost. If that doesn't convince you to read it, I don’t know what can. The novel opens after Rosie wakes up dead,which she handles quite well actually. The narrative moves on from that point as Rosie tries to figure out who her killer is, but Winter occasionally jumps backwards to before Rosie’s death in a very anecdotal style in order to fill us in on things like Rosie’s relationship with her best friend Jenny, her boyfriend Jack and her childhood friend Charles. The mystery in this book is probably the best I've ever read, no exaggeration at all, and I've read my fair share of thrillers. Normally I can see the solution a mile away, but I didn't cop this one until it was explained to me. And even then I was totally surprised. Starting out I didn't think that the mystery would be the strongest part of the novel, but it turned out to be. Of course, there is a love story, and it’s a adorable and full of cheese. But that’s great because cheese is DELICIOUS. Seriously, if the romance wasn't cheesy, I would have asked for my money back. I can never understand why people complain about these things? Rosie Potter has the best chick-lit characters I’ve ever read. Most chick-lit characters are no better than a damp dish towel, but Rosie and her cohorts were so real and leapt off the page at me. Rosie and her best friend Jenny were real, strong yet messy women, not the simpering idiots that you normally see on chick-lit and never ever in real life. Rosie are Jenny are equal parts hilarious and heart-warming. They have a great relationship, and while they might not get along all the time, they have genuine affection and love for each other. Apart from Jenny, my favourite character is Jack Harper, but I love him for completely different reasons. We probably all know a Jack Harper, and somehow the Jack Harpers of the world get away with far more than should ever be allowed. Obviously he’s not my favourite character because I like him. It’s because there are a lot of people like him in the world,and I don’t see them a lot in books or films. Jack is one of those subtle bad guys, ( think Gaston from Disney’s Beauty and the Beast), the one’s you don’t figure out are bad news straight away because they don’t wear a long black trench coat or have suspicious scars, and then it’s too late. But also Jack is just ridiculous and made me laugh despite myself. Finally, I absolutely loved the setting of the book in the rural west of Ireland. As someone who was raised in a slightly larger town than Ballycarragh, I found reading about Rosie’s life in the country gorgeous and familiar. It’s a nice change from the endless stream of books that seem to be set in London and New York. It’s nice to see rural Ireland portrayed in a more realistic way , especially because I feel like this is going to be an international hit! The only thing I didn't like about the book was the Rosie being a ghost didn't make much sense. That seems like a really stupid grievance, but as a fantasy puritan I need my supernatural content to have rules and stick to them. That being said, if you don’t read a whole pile of fantasy or if inconsistency like that doesn't bother you, this book is flawless. Overall, I greatly enjoyed this book, I devoured it in about two days. I would recommend this to everyone, especially people like me who don’t read a whole pile of chick-lit. I’ve a feeling I’ll be a lot more likely to read more of this genre after reading this book. 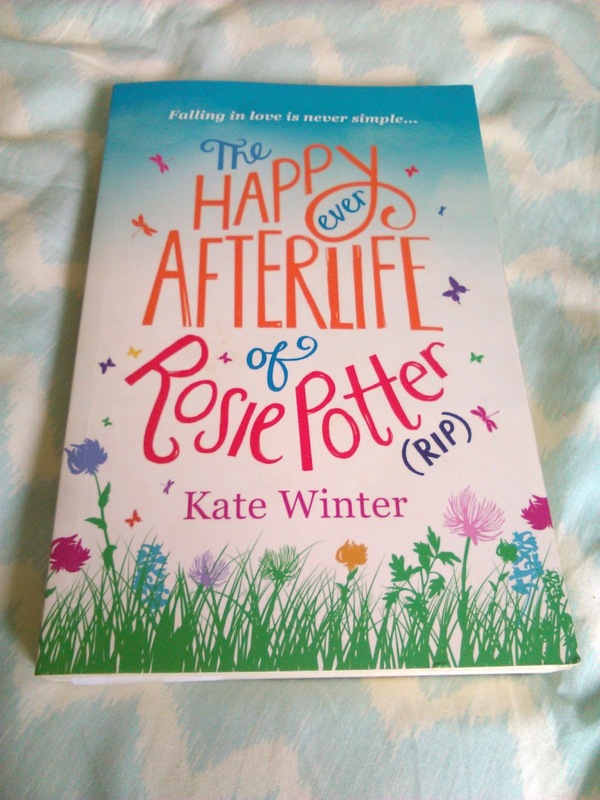 The Happy Ever Afterlife of Rosie Potter (RIP) will make you laugh and cry in equal parts, and will grip you right until the very last page.